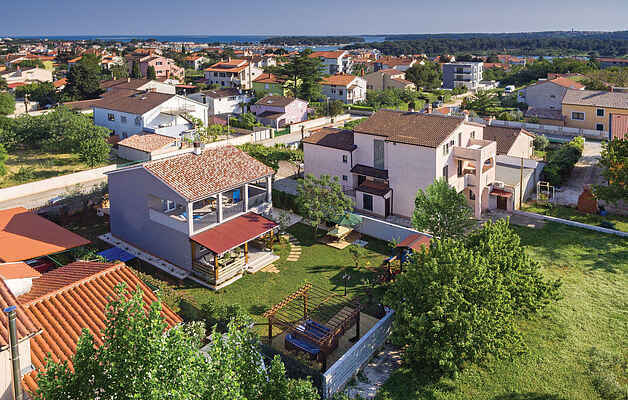 Attractive holiday house is located in the popular tourist town of Medulin, and offers everything that makes a holiday with family and friends relaxing and comfortable. Cozy living comfort, whirlpool for well-being and relaxation, the proximity to the sea and leisure activities are only a few advantages of this dreamlike domicile. Of the four bedrooms, three have air conditioning, each room is equipped with television and on the fenced plot younger guests will find various children's play equipment. Here you can park your favorite on four wheels as excellent restaurants and swimming beaches are within easy reach. Recommend is a visit to the amphitheater in the city of Pula, where many summer concerts take place.